PORTAGE PARK — Between the two of them, Chris and Roselle Touwaide have lived in nearly a dozen countries, sampling everything from Peruvian empanadas to Thai bubble tea straight from the source. 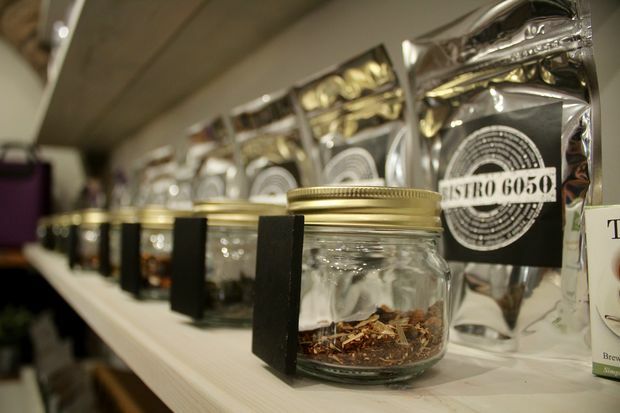 Now they're sharing all their favorites from a small storefront in Portage Park. After two years of planning, the Touwaides opened Bistro 6050 on Feb. 1, introducing the Irving-Austin Business District to a new kind of personalized, scaled-down culinary pit stop. 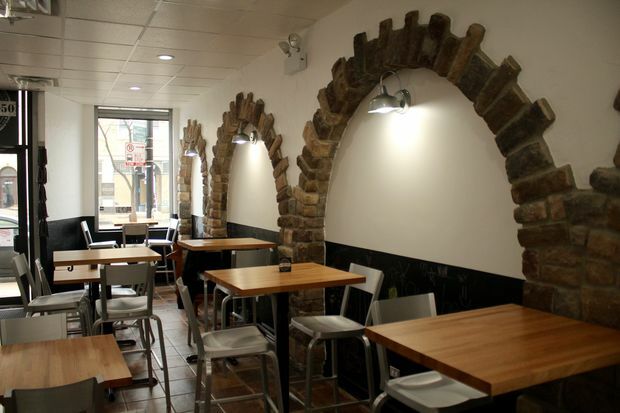 The concept is what Chris Touwaide calls a "snack bar:" not a restaurant and not quite a cafe, it specializes on finger foods, confections and grab-and-go beverages, all made from scratch. With a minimalist, chrome interior design, the eatery is "not like a coffee shop, with couches in one's living room," Touwaide said. But customers "are welcome to stay as long as they want, enjoy our food and use our free WiFi," he added. After Chris spent decades traveling the world working for a multinational government agency, he and Roselle pinpointed Chicago as the perfect spot to settle down and open up a mom-and-pop business, he said. The Touwaides bought the building, previously home to a small dive bar, in 2014, spending the interim renovating it and carving out their vision for a pan-global bistro. Their menu is a cultural cross-section of sweet and savory treats from every corner of the globe. 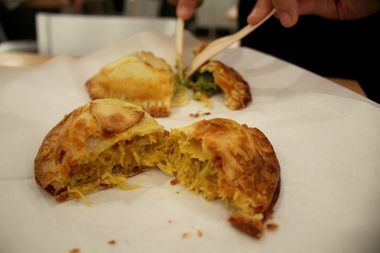 Even its most highly-featured item, a flaky dumpling-sized empanada, comes in styles mimicking Peruvian, Pakistani and Mediterranean cuisine. Their desserts, meanwhile, represent Chris' home continent of Europe with items like apple streusel and "French velvet crepes." Cups of chocolate mousse, already one of the bar's biggest sellers, are made with premium chocolate imported from Belgium. Roselle Touwaide runs the kitchen, whipping up Italian coffees and slushy bubble teas, but her most original creation is a snack she calls "charcoal nuts," bags of mixed cashews and walnuts seasoned with cayenne pepper, nougat or maple syrup. 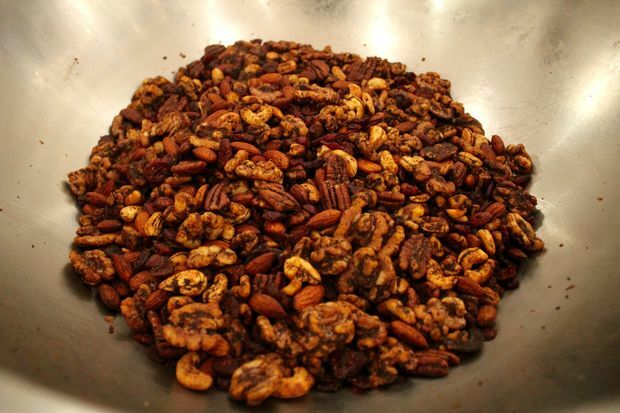 "A lot of bars and other places put out nuts, but they almost always all taste the same," Roselle said. "So I thought I would try something different." In the middle of a business strip mostly populated by fast food restaurants and hot dog stands, being different can be an asset, Chris said. 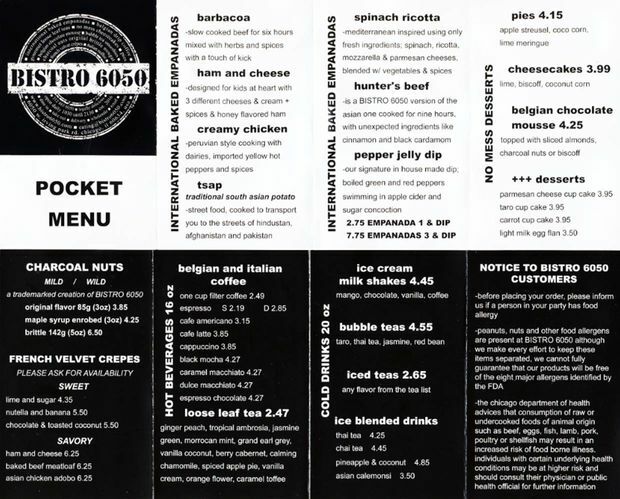 Bistro 6050 is open noon-9 p.m. weekdays and 11 a.m.-6 p.m. weekends. 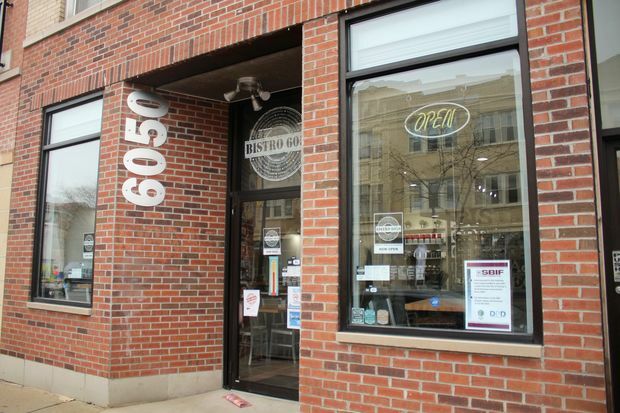 Customers can organize private events at the snack bar by emailing eating@bistro6050.com.